Wigan chairman Dave Whelan has suggested the club may be prepared to cash in on striker Emile Heskey in the January transfer window. The 30-year-old has stalled on renewing his current deal and Heskey has been linked with several of Wigan's Premier League rivals. "Emile is out of contract in the summer," said Whelan. "It could cost us £3m or £4m if that goes on to the summer so we'll have to see what January brings." Everton, who have lost striker Yakubu for the rest of the season, are the latest club to be linked with Heskey, joining Liverpool, Aston Villa, Manchester City and Tottenham as a possible destination if he does leave the JJB Stadium. Heskey's international form has been a major catalyst for the heightened interest after his lengthy international exile was ended by previous boss Steve McClaren during the Euro 2008 qualifying campaign. He returned for the qualifiers against Israel and Russia, and has since emerged as a key part of Fabio Capello's regime. Should Wigan do more to retain Heskey? However, doubts remain surrounding the Leicester-born striker's goalscoring record. He has just netted five goals in 50 England appearances, while at club level Heskey has recorded just 15 goals in 81 league and cup games for the Latics. 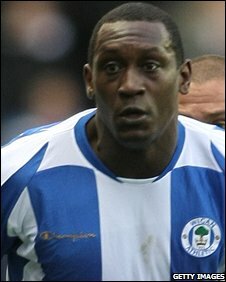 Wigan paid a club record £5.5m for Heskey from Birmingham City in July 2006.